(CNN) Remember the Skreemr, a concept for a supersonic plane that could travel at Mach 10? Scratch that, there’s now a design for a plane that could cruise from London to New York in 11 minutes, traveling at Mach 24 — that’s 12 times faster than the Concorde! Charles Bombardier, the industrial designer who came up with both designs, has dubbed this newest concept the Antipode, which he conceived in collaboration with Lunatic Koncepts founder Abhishek Roy. In theory, it could carry up to ten passengers up to 12,430 miles in under an hour. Did you just daze out? Bear with us a little while longer while we explain the tech that would get this craft flying. 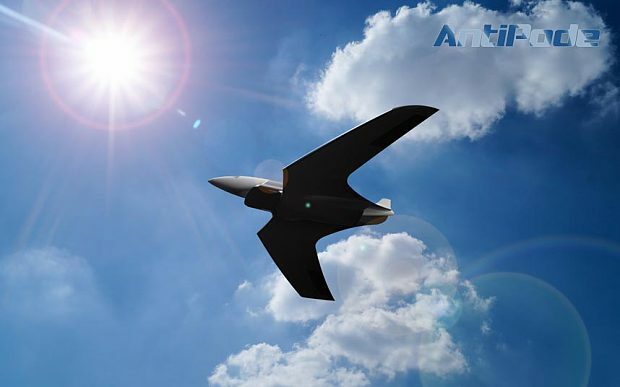 The Antipode’s wings would be fitted with rocket boosters that would propel the aircraft to 40,000 feet, and enable it to reach Mach 5. Like the Skreemr, the plane would be powered by a scramjet engine. Unlike conventional jet engines, scramjet engines have virtually no moving parts. And unlike rockets, scramjet engines would burn oxygen from the atmosphere instead of having to carry heavy tanks full of oxygen. Now, the Skreemr concept got some flack for the challenges presented using some of the same technology. One big problem was heat. Objects traveling past Mach 5 can reach upwards of 980 C (1800 F), and there is a limit to the type of materials that can withstand those kinds of temperatures. The sonic boom is also all but guaranteed when an object breaks the sound barrier, and is a menace in urban areas. However, Bombardier believes he may have found a solution to both issues. After the Skreemr concept made the rounds, Bombardier was contacted by Joseph Hazeltine, an engineer at Wyle, which provides technical support to both NASA and the U.S. Department of Defence. Hazeltine suggested using an aerodynamic technique called long penetration mode, or LPM, which would use a nozzle on the aircraft’s nose to blow out air and cool down the surface temperature, while muffling the noise made from breaking the sound barrier. Yes, it’s above our heads too. Still, impressive though these techniques all sound, most of the technology in this design is still decades away from seeing the light of day. Even NASA hasn’t created a stable scramjet yet. The Pentagon came closest, launching a small, unmanned scramjet aircraft in 2013 that hit Mach 5. Note: There’s been nothing commercial, and nothing approaching anything near the speed Bombardier is suggesting with the Antipode. The designer himself doesn’t seem too worried that his concept is still decades away. Next In a future brave new world will it be possible to live forever?